Beat writer Jon Krawczynski reports in The Athletic that veteran guard and clubhouse presence Jimmy Butler has requested that he be traded less than a week before training camp is set to open. 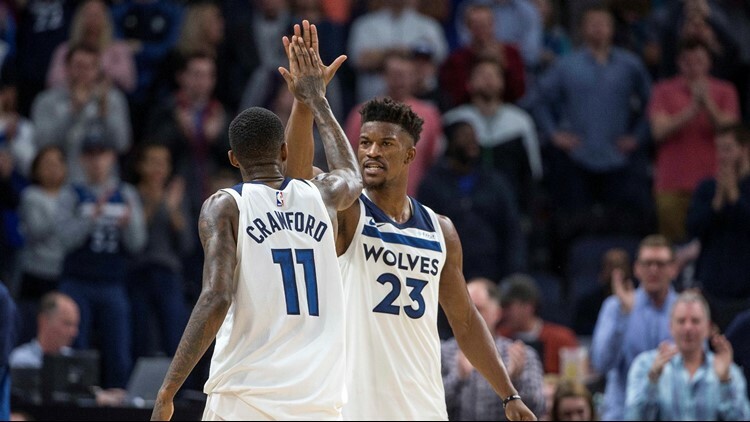 MINNEAPOLIS - Just when it seemed things had stabilized with the Minnesota Timberwolves, turbulence appears to be rearing its head again. Beat writer Jon Krawczynski reports in The Athletic that veteran guard and clubhouse presence Jimmy Butler has requested that he be traded less than a week before training camp is set to open. Krawczynski cites league sources who told him Butler met with Wolves coach Tom Thibodeau (also Butler's coach in Chicago) in Los Angeles Tuesday to discuss Butler's status with the team. It was in that meeting, Krawczynski reports, that Butler told Thibodeau he does not intend to sign a long-term extension with the Wolves next summer and wants to be dealt. He reportedly provided a list of one to three teams with which he would be open to signing a long-term deal, sources said. Butler averaged 22.2 points, 5.3 rebounds and 4.9 assists in nearly 37 minutes per game last season. As importantly, he set an example for what many considered to be a previously soft young Timberwolves team with his tough work ethic and "never say die" attitude.